Can you believe it's December? 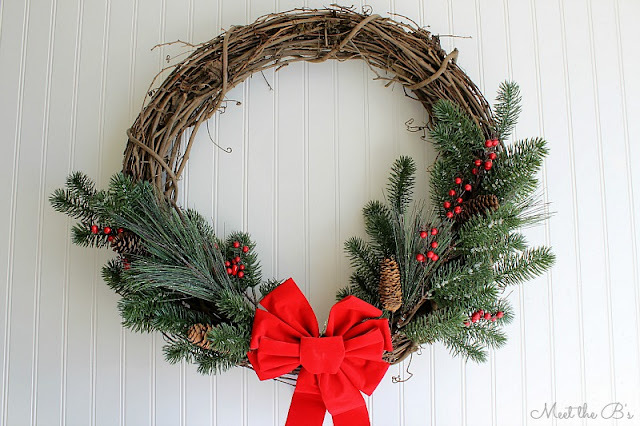 I was just thinking the other day about how I somehow managed to pull off last December's Monthly DIY Challenge wreath project just a week after my son was born. I don't know where I got the energy or the creativity to do that at such a crazy time! And now it's already one year later! Time really does fly..
Now that it's December, it's time to get a little festive around here! 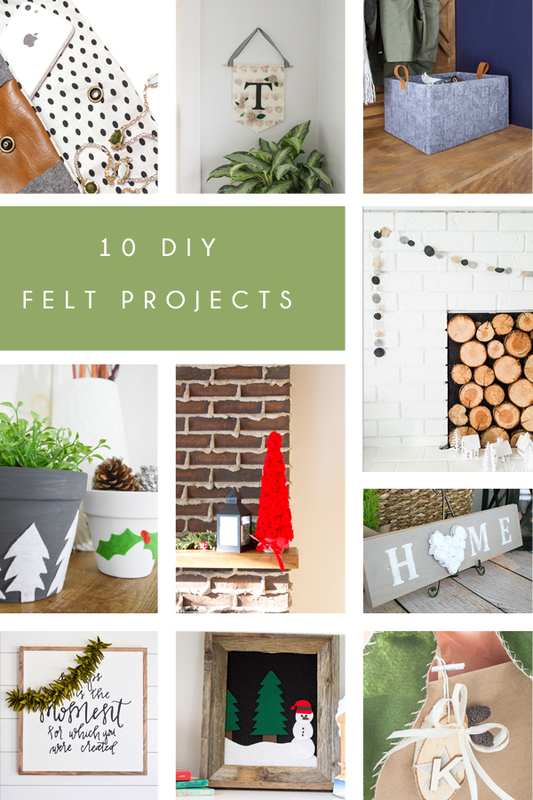 When my friends and I decided on felt as this month's Monthly DIY Challenge theme, I brainstormed for ideas that would help our family get in the Christmas spirit. 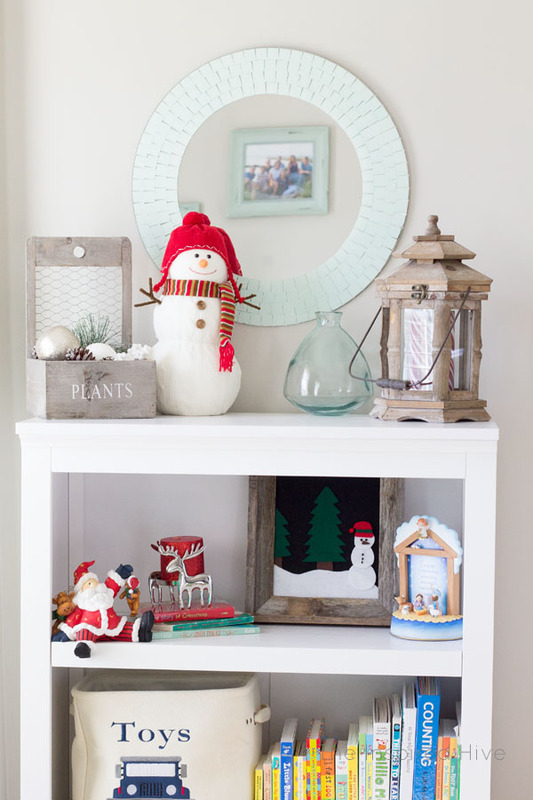 We have lots of pretty Christmas decor, but this is our first year with our little guy sprinting around the house during the holidays (last year he was just a month old at Christmas and snuggled warmly in my arms all the time! ), so we need some more kid friendly decor. 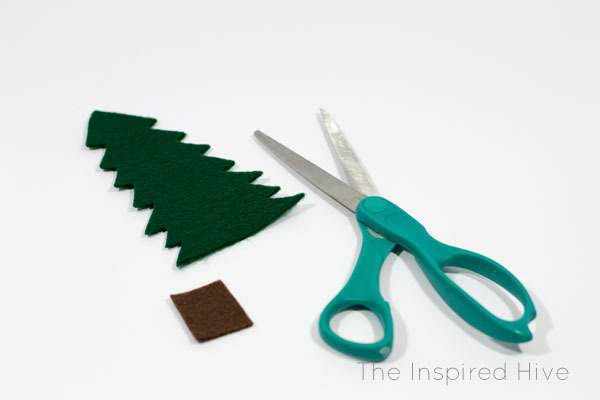 See what I came up with below, and then check out nine other DIY felt ideas from my friends! I decided to make some DIY framed art with my felt. As I perused the aisles of my local craft store, I originally intended to just make a snow scene with a Christmas tree, but as I was making the project, it seemed very plain. I thought adding a snowman would make it less boring but also make it a little happier looking to a kid! I bought felt sheets in Christmas colors and the other colors I thought I would need. The black sheet for the background is actually a stiff felt which makes putting it in a frame easier, but you could also glue regular felt to a piece of poster board if you want it to be a little sturdier. First, I cut the black background felt to fit in an 8x10 frame. 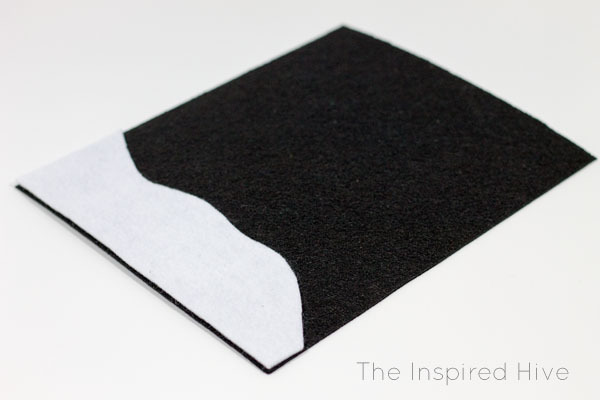 Then I cut a strip of the white felt into a curvy shape to mimic a snowy bank. Then I just started cutting the shapes I would need for my design. I hand cut the tree outlines and cut some circles for the snowman. 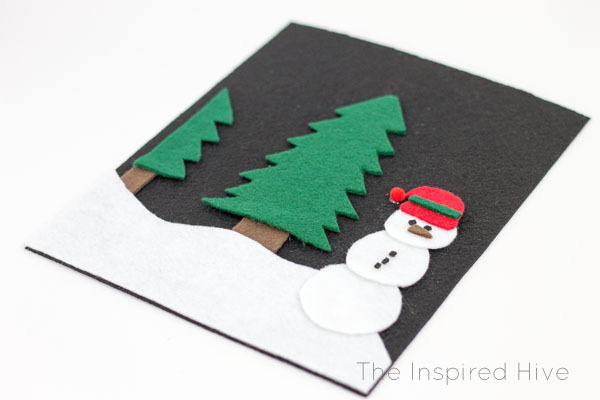 You can easily find templates or stencils online if you're not comfortable free-handing it. 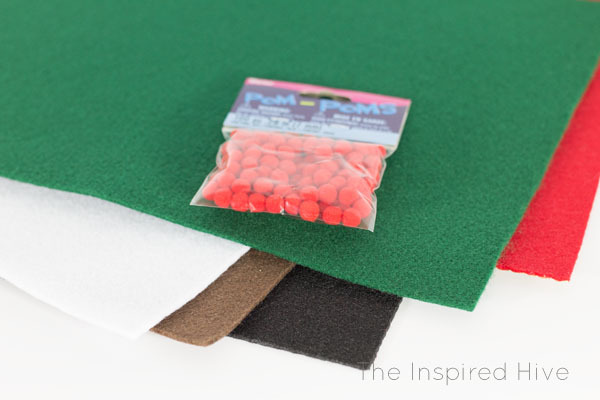 I used fabric glue to attach the pieces to the black felt background. Regular glue would probably work too, but I chose fabric glue because it is a little tackier, so it doesn't absorb into the felt as quickly giving you time to adhere your felt pieces..
For the snowman, I glued the circles onto the background, and then cut out a hat shape, a nose, and some small pieces for eyes and buttons. I added a green stripe for the hat. I glued everything down and then glued a small craft pom pom to the hat. I ended up adding a second tree to the far left because it still looked too plain to me. That's the beauty of making art yourself... you don't need an exact plan. You can just wing it and add things as you go! 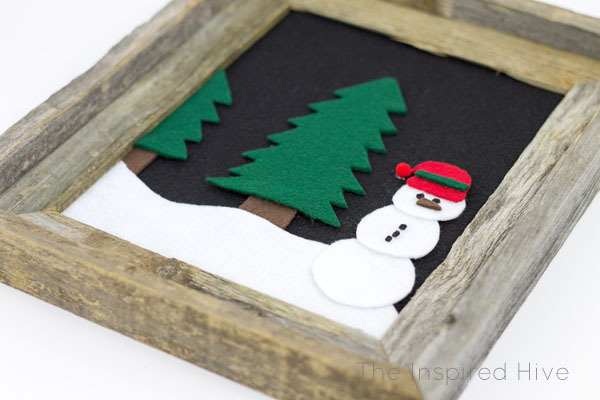 I removed the glass from a rustic wooden frame and popped my new felt art into the frame. Tah dah! 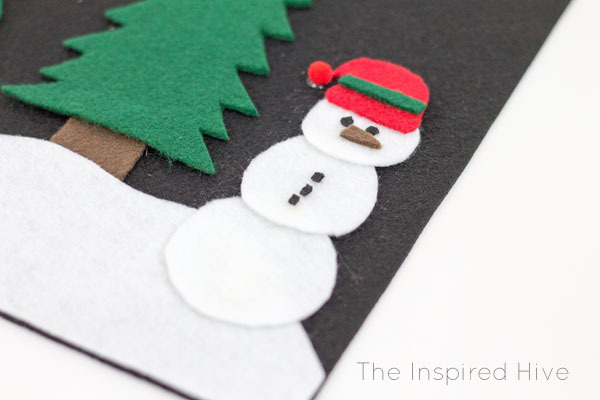 Easy, kid friendly, festive felt art! 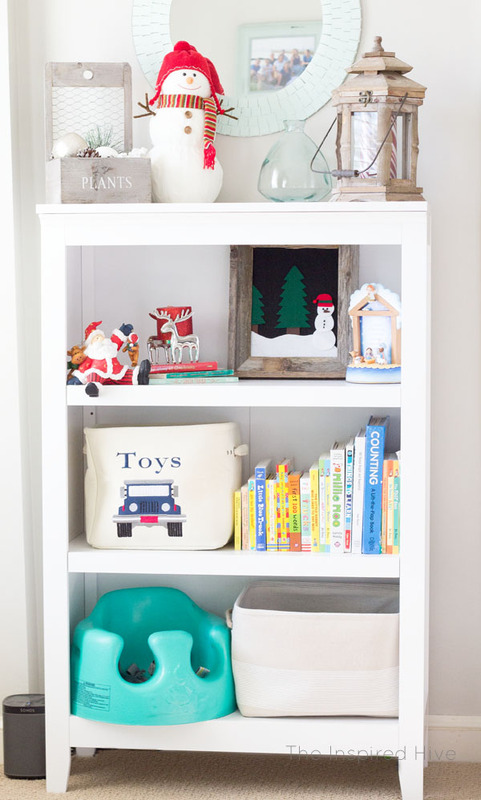 By putting it in a rustic frame, it's still pretty enough to satisfy my own decorating taste while fitting in perfectly in my little guy's playroom! My mother-in-law gave us that cute little Christmas story advent frame sitting next to our new felt art. It has 25 cards in it that each have one line of the story of Jesus' birth. Such a cute idea for little ones to learn the meaning of Christmas! Aside from the holidays, this room has come so far in the last year! From basically an unused formal living room, to our playroom, now this is where we spend most of our time! This shelf holds many of my son's toys in those bins (while the rest stay strewn across the room 😉) and some of his books. The rest of the books are in the book storage crate I made for his nursery. And do you spy that speaker in the bottom corner in the photo below? We love our Sonos system, and putting one of the speakers in the playroom allows us to jam out to kid stations on Pandora or Amazon Music all day while Daddy is at work! I love how this space has come together. There's no reason a play area can't be both cute and functional! This is so cute, Nicole! 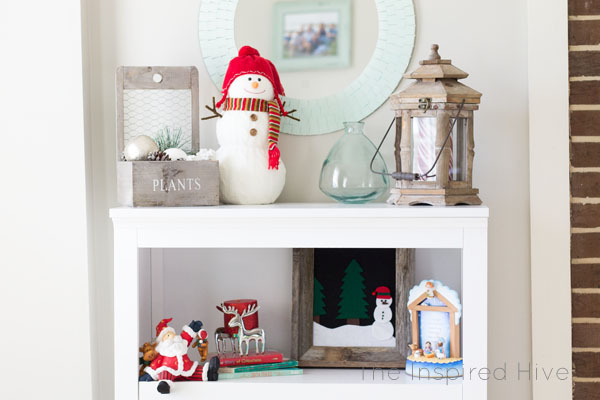 Perfect for a fun, easy holiday project. 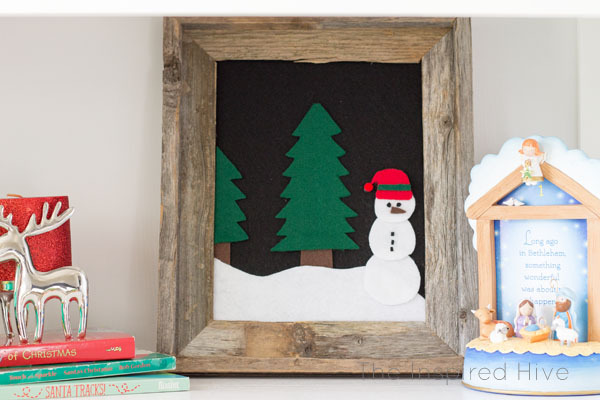 The rustic frame is perfect too! Nicole, absolutely love the picture! And the barnwood frame. You're right, the picture needed that extra tree in it. Did you glue the pieces of felt down? I know you must have. This is such a cute idea! Love that it's in Cade's room, I bet he loves it!